Clairelicious | My big fat beauty blog! 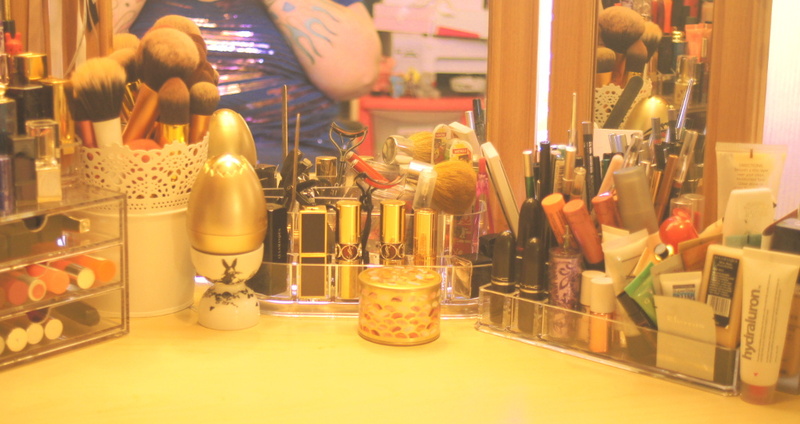 Following on from the first post I have some pictures of my drawers, but as I dont want to pic-spam you too much I’ve not photographed everything (such as my hairbrushes, hair accessories, and my rolling cart full of hair supplies). Beside my desk I have two Ikea “Helmer” drawer units, and a wheeled open basket trolley underneath my desk. The trolley holds my hair tools, hair care, styling products etc. On top of the left Helmer unit I have a rotating carousel that holds hair brushes, sectioning clips and hair sticks. On here also live a few random bits such as tissues, hand sanitiser and my new cute, yet utterly useless bunny cotton wool holder! I shall do a quick run-down of what each drawer has along with a picture. You will be able to see in these photos that I have used old Glossy boxes and Birchboxes as dividers for my products. I find this helps me keep some sense of organisation! I just wanted to show that you don’t need to buy anything special to help you organise – just some pieces of cardboard and tape can help to keep bits and bobs in check. Top drawer has my stash of lip balms, with a couple of scrubs in there and the remainder of my lipsticks and lipglosses. I have to say I have a bit of a thing for lip balms and I honestly believe you can never have too many of them! 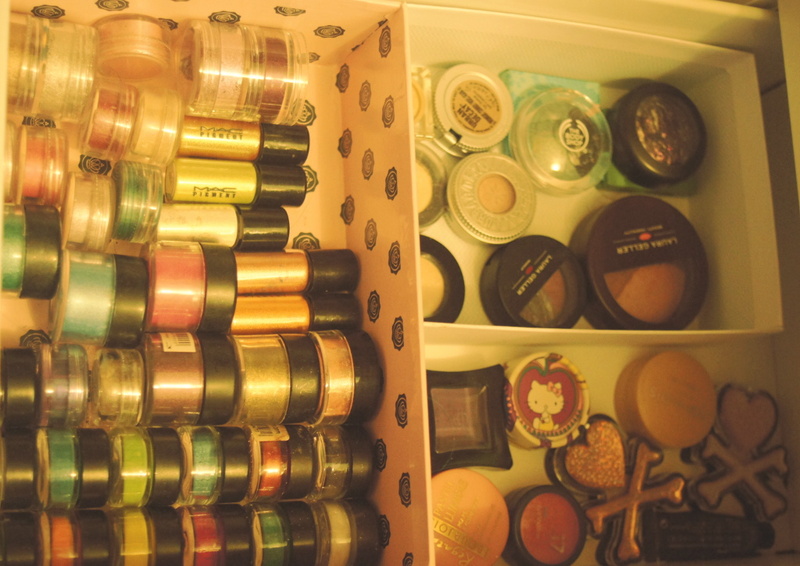 Second drawer has pigments and loose eyeshadows – MAC, Barry M dazzle dusts and a few others. It also hold the rest of my single eyshadows. Third drawer contains mascaras, eye primers and some eyeliners. 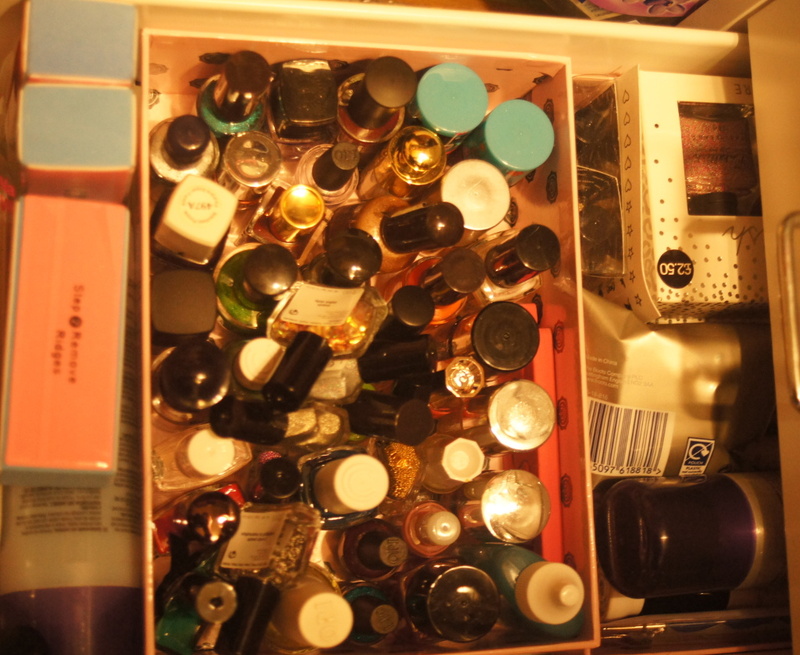 Fourth drawer is more base products. Primers, concealers, blushers, contour, bronzers finishing powders etc. 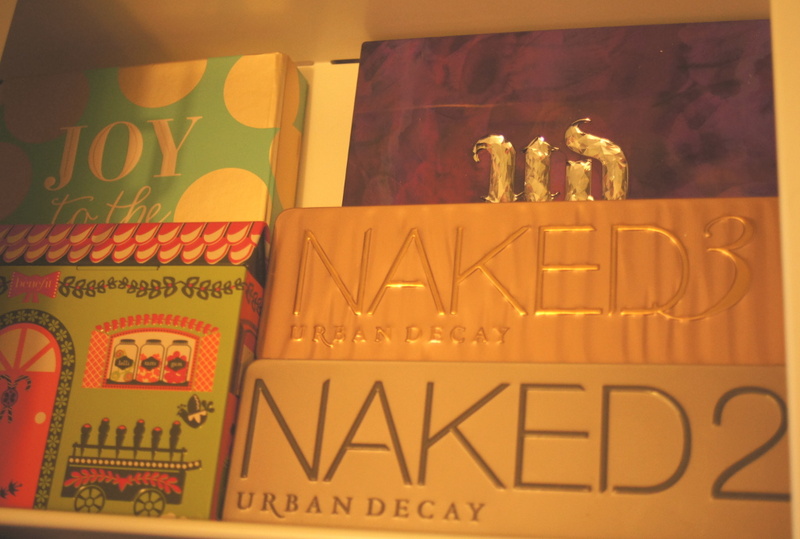 Fifth drawer is some of my palettes, I have a lot of Sleek palettes and a few Urban Decay palettes. I have another drawer of palettes in the other Helmer and a separate box of limited edition collectable Dior palettes that I collect. The bottom drawer hold nail and hand products. I have nail tools, base coats, files and some nail polishes in here, I also have another drawer in the other Helmer unit dedicated to nails as well as a large Ikea “Ribba” picture rail used as a shelf to store the rest of my nail polish stash. The second Helmer isn’t full yet. I’m still trying to organise myself. The top drawer has hair ties, grips bands etc. 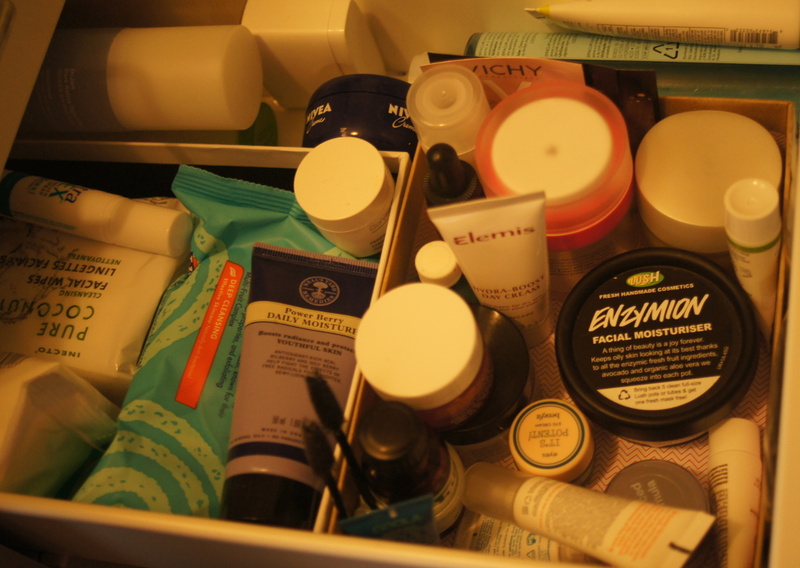 The second drawer has some skincare, moisturisers and eye creams and the like. 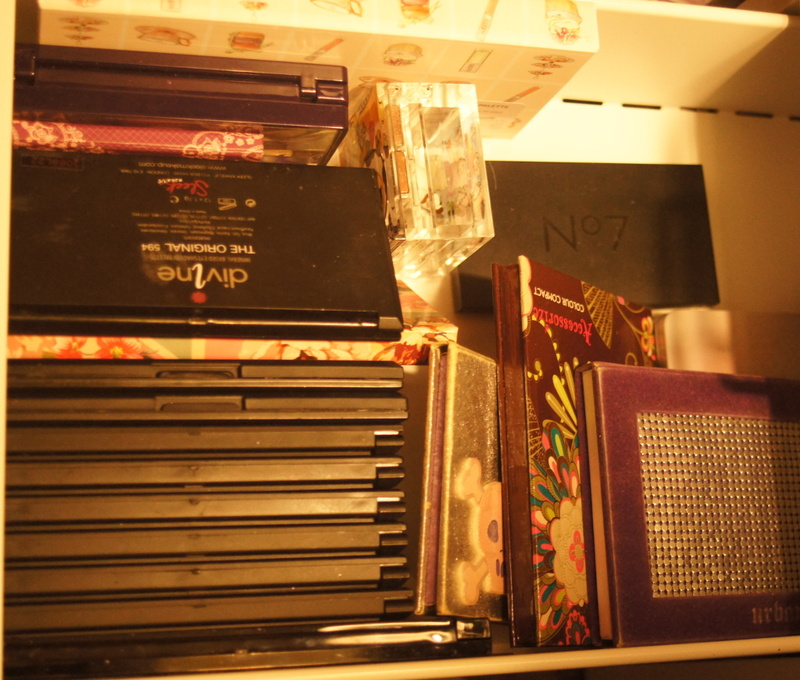 The third drawer has some more of my pallettes, blush pallettes as well as eyeshadows. The fourth drawer has some face masks etc, but the majority of my skincare are all stored in empty Glossyboxes that have been labelled and placed in book shelf. I won’t be posting pictured of those anytime soon as that side of my room is very messy! This concludes my little tour, if you spy a product and want me to review it, or know what it is please leave a comment below and I will do my best. Any other comments and constructive criticism are welcome as well! Thank you for reading. 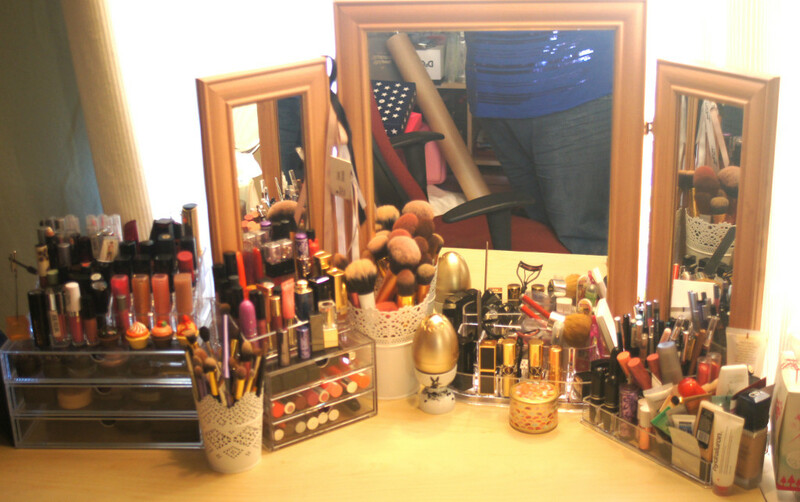 Hi guys, I wanted to kick off the blog with a little sneak peek into my make-up stash. I know a lot of my friends and family know I own a lot of makeup but I know most of them have never seen my collection in full. First things first though; this is in no way meant to be a brag or boast about the amount of cosmetics I have, I just know I like to read about other bloggers’ collections and I thought you might find it interesting. Okay I will admit it now – I’m nosy and I’m giving you all a chance to have a nosy too. I am going to split this post into two separate posts as it will be a bit picture heavy. Here are a few photos of my desk. I have a large three panel mirror and the dreaded stand-alone magnifying mirror (which I know we all have a love/hate relationship with). As you can see I have some acrylic storage, and although it is a bit of a blogger cliché to have some clear storage, I do find it very useful to be able to see some of my most used items. I can say that only one of my sets of drawers are from Muji, the others have come from Staples and TK Maxx. I find it’s always worth looking around for storage as the two brush pots on the desk are actually flowerpots from Ikea. I will go through what’s in my storage from left to right as shown in the photos. 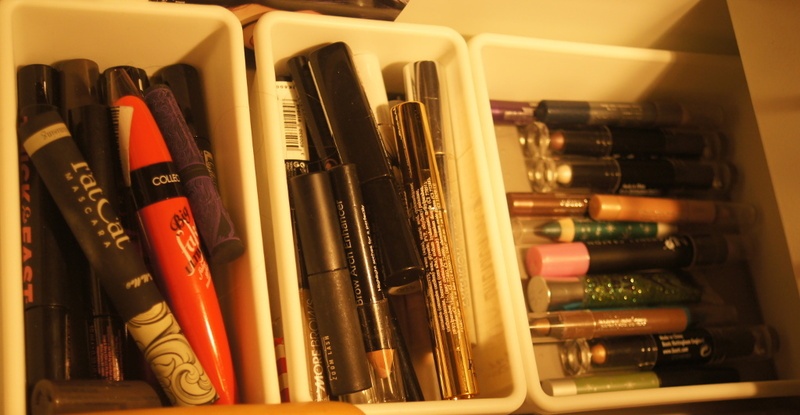 In the left most set of Muji drawers I have gel eyeliners and cream eyeshadows in the top drawer, and some of my most used powder eyeshadows and a brow powder kit in the middle drawer. 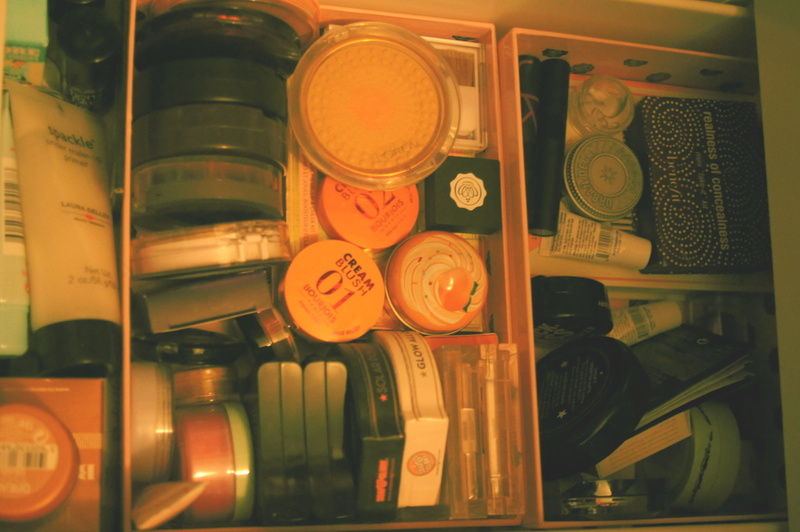 The bottom drawer of this stack holds some of my most used blushers, highlighters and contour powders. 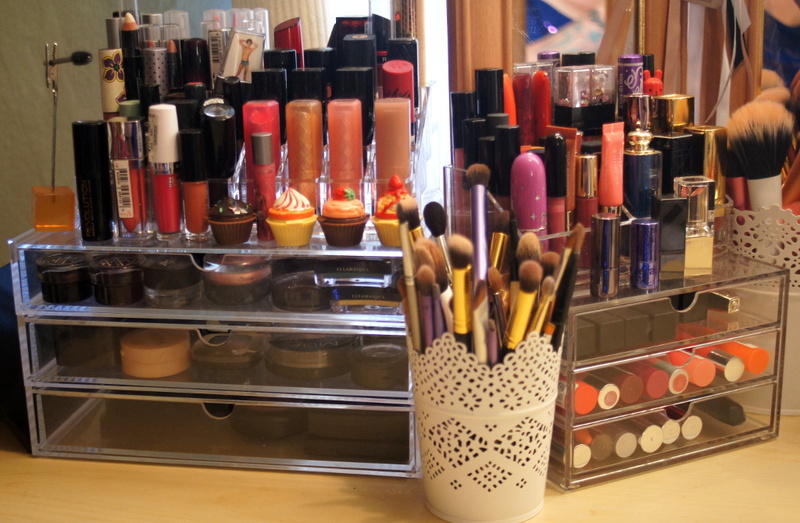 On top of these drawers is a tiered lipstick holder containing some drugstore brands of lipstick, and a space for longer lipglosses and more lipsticks. My next drawer is a smaller 3 drawer set from Staples. I have yet more lip products in here (can anyone say addiction?). 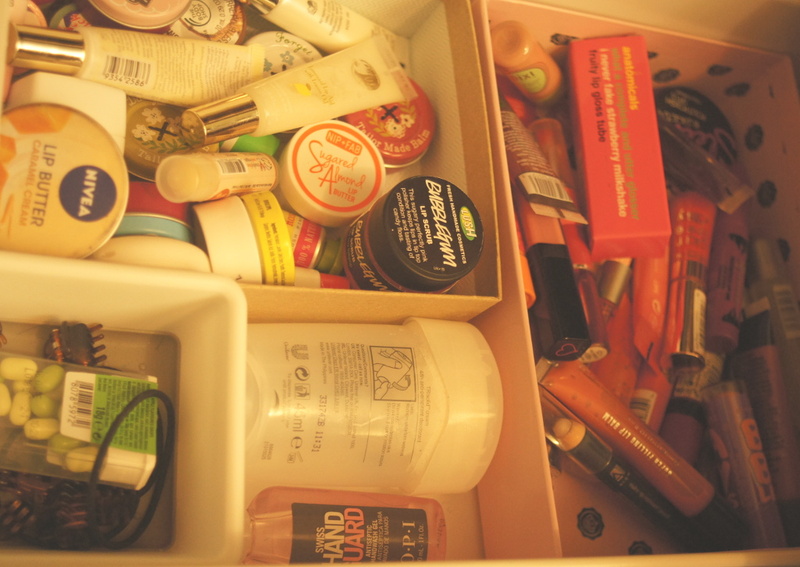 The bottom two drawers contain lip crayons, (Clinique Chubby Sticks and Revlon Balm Stains etc. The top drawer is Sleek lip glosses, and some Revlon and Loreal gloss type stains. The holder on the top of this little stack of drawer has some of my High-end lipsticks and glosses. I have two brush pots – one holding face brushes and the other eye brushes. In the centre is a small acrylic holder which has more high-end lipsticks plus beauty tools such as tweezers, eyelash curlers sponges etc. The acrylic holder on the right has pencils (lip and eye), more lipsticks, and some face products: primer, foundations, concealer etc. To round off this first post I will add that, yes, that is indeed an egg-cup with a golden egg in it (its a Tony Moly primer)!